A major, tier-1 automotive supplier needed a new heavy and light-duty alternator tester with access to the source code. The Ball Systems team designed, built and validated a single alternator end of line manufacturing tester capable of testing more than 125 DUTs, allowing the company to have one tester for many different types of alternators. To ensure the new custom system in scalable for future needs, we delivered source code, so their team can now modify the test sequences as needed. 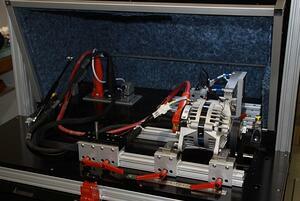 With the new custom test system, the customer can verify the mechanical and electrical quality of their devices. We worked closely with the customer’s team to ensure a successful and on-time project completion. The solution that we provided to our customer is not only less expensive overall than the previously purchased solution but also less expensive to maintain and train users on. Learn more about this alternator tester.